Homepage > PEUGEOT 107 REAR SHELF AND SPEAKER KIT [Fits all 107 models] 1.0 1.4 HDi NEW! Enjoy high quality sound thanks to the two speakers integrated in the shelf. Designed for your vehicle, the shelf is perfectly suited to the dimensions and interior style of your passenger compartment. It keeps objects in your boot out of sight of prying eyes while improving the sound quality in your passenger compartment. Product Description: Enjoy high quality sound thanks to the two speakers integrated in the shelf. Designed for your vehicle, the shelf is perfectly suited to the dimensions and interior style of your passenger compartment. 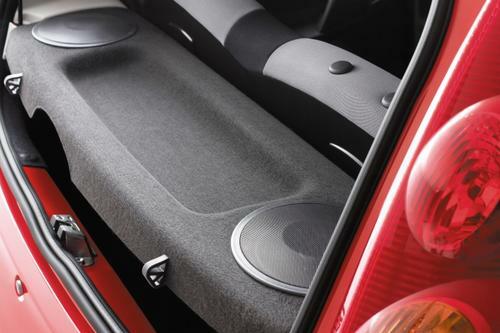 It keeps objects in your boot out of sight of prying eyes while improving the sound quality in your passenger compartment.